What I like most about Fieldnotes is that they are durable enough to carry every day in my pocket and not get all messed up! The paper is primo and feels good to write on. So long to all the scraps of paper stuffed in my pockets…..hello Fieldnotes! Click on one of the pictures to go to the FieldNotes website. 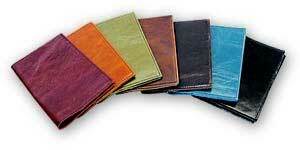 If you want a little elegance you can get a handcrafted leather cover at Renaissance Art. Not only do these leather covers look great on your Fieldnotes , they are thin they will still fit comfortably in your pocket. 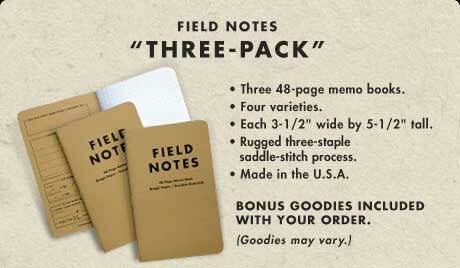 The “pocket size” cover fits Fieldnotes refills. Click on the picture to go to a page with more information. 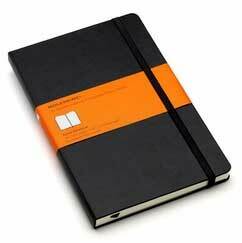 These journals are great for taking daily notes and journaling. Similar to the Fieldnotes, these journals are durable and hold up well under daily use. Plus, they look great! They are larger (5-1/2 in X 8-1/2 in), have rounded corners and an elastic enclosure. The 240 lined acid-free pages are thread bound. Each journal includes an expandable inner note holder made of cardboard and cloth, and each Moleskine journal has a ribbon placeholder. Click on the picture to go to a page with more information. 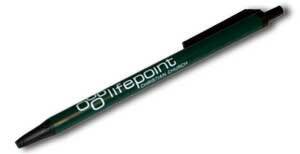 My favorite day-to-day writing instrument is my “Lifepoint” Bic pen. You’ll have to visit Lifepoint Christian Church to get one (we’ll give ya one free). 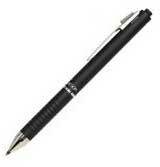 This is a great pen……an all-in-one! I use a pencil when I take notes in books, so this one saves the day. Made by Autopoint this 3-Way, Multi-Action, pen combines 2 inks (black, red) with 0.5mm pencil in one unit and is a comfortable black matte with chrome trim. Click on the pen to see more. For those of you who would rather have a 4-way pen (black, red & blue ink plus a pencil), click here. This pencil is great for highlighting books and the Bible. Eight bold colors in one amazing pencil: red, blue, brown, orange, yellow, light green, pink, and light blue. 2.0mm lead diameter produces bold lines of consistent density. Great for highlighting high cotton or linen fiber paper such as, bibles, encyclopedias, and dictionaries. While expensive ($24), it’s a great tool for deep Bible study. Click Here for more information. Okay, this little baby is AWESOME! 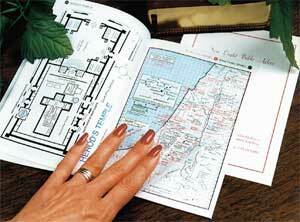 I used to read the Bible and never really knew where these places were that I was reading about. Not any more! This 40-page book (5 3/8″ x 7 3/4″) attaches permanently in the back of your favorite study Bible, or if you prefer, attach the optional cover and use your Bible Map Insert as a separate atlas. Find over 2000 locations referenced in the Master Index. The Modern Day Overlays show 250+ locations, allowing you to tie your Bible study to current events. Click on the picture to go to a page with more information.